Worth renting. A good film for a family movie night or a lazy afternoon. What is it lately with all these talented directors challenging themselves to turn TV movie scripts into potent, or at least cogent feature films? Steven Soderbergh took the lead with "Erin Brockovich" -- a Lifetime Channel story in anybody else's hands -- and with the help of Julia Roberts created this year's Oscar front-runner. Taylor Hackford took the hostage negotiation thriller "Proof of Life" and gave it real punch and humanity, when Hollywood doctrine dictates it should have been either a women's weepy concerning the wife's angst or a Dolph Lungren-level action flick about a rescue raid against Colombian kidnappers. Now Gus Van Sant, onetime guardian of the quirky avant guard ("To Die For," "Even Cowgirls Get the Blues"), takes on an After School Special of a script about a ghetto littérateur savant and his reclusive white mentor, and creates "Finding Forrester" -- a solidly enjoyable, fairly cerebral feature raised above its roots by stout performances from its two leads. Newcomer Rob Brown plays Jamal, a basketball star at his Bronx high school who is a secret intellectual on the side. His bedroom walls (in his mother's brick tenement high-rise apartment) are stacked with books by Kierkegaard, James Joyce, and other highfalutin Lit class favorites. But on the street "all he talks about is basketball," while his gray matter goes undernourished at school. Enter Sean Connery as William Forrester, the neighborhood's local crackpot recluse. Called "The Window" by Jamal and his pals, he hasn't left his apartment in longer than anyone can remember. He just watches people with binoculars out his window day after day, occasionally receiving deliveries from a Manhattan yuppie driving a gold BMW. The two meet when Jamal's buddies dare him to climb the fire escape and sneak into Forrester's living room while he's sleeping. The budding writer discovers bookshelves full of common interests before being so startled by Forrester coming out of the shadows that he drops his backpack and runs out the front door. After finding his backpack tossed in the street and the journals inside marked up in red pen with corrections and questions, an intrigued Jamal braves another trip to the old man's flat, and slowly an antagonistic friendship and mentorship forms. It turns out that Forrester is a prestigious writer -- a fact Jamal discovers when his off-the-chart aptitude test scores and his skills on the court land him a scholarship to an exclusive private school. Forrester's singular book is assigned reading in a high-brow writing class, taught by a bitter, pompous professor (F. Murray Abraham), who, of course, is skeptical of Jamal's literary gifts. The film's respectable plot revolves around Jamal and Forrester, who bond during after-school writing sessions in Forrester's dusty apartment. The film's hackneyed conflict arises when Jamal is accused of plagiarism by the snooty prof who recognizes the influence of Forrester -- an old rival -- in his student's entry in The Big Writing Competition. Honoring his oath of secrecy to his tutor, Jamal finds his school career in jeopardy. Connery is perfectly cast as the quarrelsome egghead Forrester, who plods around his musty, hardback-lined pad in a frumpy sweater, pajama bottoms and slippers, spouting quotable insights like, "No thinking! That comes later. You write your first draft from the heart!" Sixteen-year-old Brown, a first-time actor, more than holds his own against his luminary co-star, lending both street cred and contemplative, discerning cognition to the movie's appealing young hero. Van Sant clearly recognizes the pedestrian nature of this story because he sidesteps several clichés that rear up throughout. The petulant reigning hoops hero at Jamal's new school does not become a lame rival. The pretty, rich schoolmate (an alluring Anna Paquin) who flirts with Jamal in front of her disapproving daddy doesn't turn into an interracial romance subplot. There's little time spent on how Jamal's Bronx pals feel snubbed by his newfound, brainy interests. This all comes as quite a relief, but at the same time one has to wonder why Van Sant set up these potential story detours if he wasn't planning to follow them anywhere. I got the definite impression a lot of footage was left on the cutting room floor. 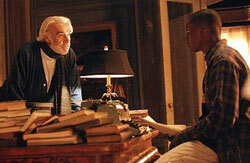 There's nothing extraordinary about "Finding Forrester" other than the fact that it attracted the kind of talent that could lift it above its banal origins. Van Sant gives the film the same confident but sentimental air of underprivileged intellectualism he bestowed upon his 1997 film, "Good Will Hunting" -- but with a lesser degree of success. The film is certainly satisfying -- if predictable -- but it's not the Academy fodder its producers hoped it would be. However, it is a credit to both Van Sant and his stars that "Forrester" is at its most satisfying when simply spending time on the affinity shared by the well-matched leads as they type and talk together, challenging each other to grow -- Jamal honing his skills as a writer, Forrester being eased out of his social apprehension.